"My two-year-old Akita mix Jemma was often intimidated by strangers and larger dogs. In just a few exercises, however, Lindy taught Jemma how to feel at ease in what had been -- to her -- worrisome situations. And using other skills she mastered in class, Jemma subsequently passed both her Canine Good Citizen and Therapy Dog tests. I would rank Lindy alongside Leslie Nelson and Andrea Arden as among the finest trainers I've ever learned from. But as impressed as I am with Lindy's skills as a trainer and behavior specialist, I'm most impressed with the care and affection she devotes to each pup in her class." Lindy Nolan is the "Crocodile Dundee" of Boca Raton!! Our new arrival, Sophie, was much more than we could handle. After three weeks of trying to get some semblance of control over our new puppy, we were given Lindy’s name by a friend of ours. House training and mouthing and biting were two major issues we were getting progressively frustrated with. One brief phone call brought Ms. Dundee to the rescue. Lindy walked into our house and literally within minutes, Sophie was calm, under control and actually obeying her new teacher. It was quite awesome to witness. Lindy skillfully taught us how to be the "alpha" in our pack. It didn't happen overnight, but after a few private sessions with Ms. Dundee and attending her puppy school, we found ourselves blessed with a truly wonderful dog. We all enjoy the group lessons... We get to make new friends and Sophie does too, and we have fun at the same time. Recently, we had the opportunity to have Lindy’s dog, Hannity, visit with us for a week-end. Lindy would always stress to us the importance of having a "polite" dog, but we didn't quite grasp what she meant until Hannity came to spend the week-end. He was truly a polite dog. He would always wait to be invited up on the sofa... He never just jumped up uninvited. He would greet us when we returned from an outing by fetching his favorite plush toy and prancing around with it in his mouth while his tail wagged happily...He would never JUMP UP on us to greet us. Hannity showed respect and consideration, indeed qualities of politeness. Quite extraordinary! !Lindy, and both her dogs, Murphy and Hannity, have been an inspiration to Joel and I. The "Nolan Pack" is a testament to Lindy's skill and expertise in dog obedience training. Dear Murphy, so much in life is not recognized for its positive effect on us. This letter is to recognize you and your lovely human (Lindy) for all the great work you both do to help others. 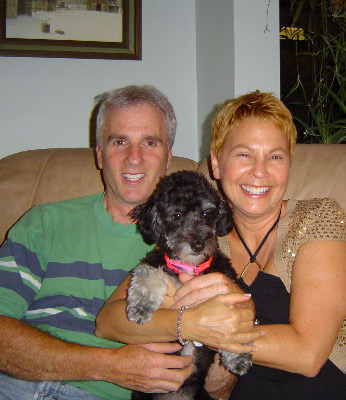 Bobbie, (my human) and I, have received much pleasure from the obedience class Lindy and you hold on Wednesday nights. We have gained such confidence and good advice from all your expertise. Dude, we’re so lucky to be working dogs. We get to go to work with our humans and have so much fun. Keep up the good work with your human and her friends. Your professionalism is so refreshing. Miles and Liam, my two whippets, have been in Lindy Nolan Dog Obedience training for a few months. They have improved so much and I believe they are finally getting it. The classes are so much fun but take a lot of work everyday. Lindy’s approach to training is simple common sense, lots of positive reinforcement, constant repetition and a lot of dog and people psychology. Her training really works! She has such a contagious personality and that’s why dogs and owners respond. 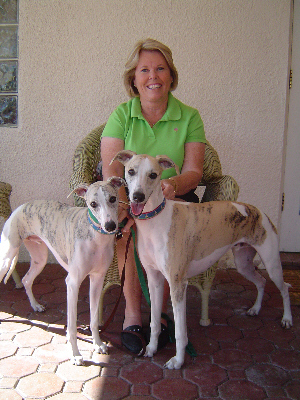 Working with Lindy is such a treat, and your dogs will be forever grateful for their happy household.